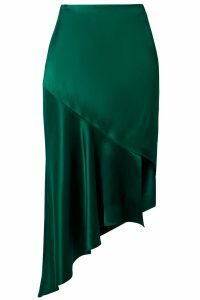 The slip skirt – which was so loved in the ’90s – has fully found its place back in fashion’s good books over the past few seasons, with the simple and elegant design easy to bring out for any occasion. And now, the skirt version of the silky frock has become a trend too. Easy to pair with everything from T-shirts and trainers to heels and camisoles now and ankle boots and knits come the autumn, here are 15 slip skirts every fashion editor has on her wish list right now. This asymmetric skirt will work all-year-round because of its dark hue.